Aaron Sorkin’s current mode of zeroing-in on a complex, highly intelligent, contemporary biographical subject, and then dissecting that individual with his sharp dialogue and narrative structure, continues in Molly’s Game. Sorkin’s screenplays have resulted in marvelous efforts such as Charlie Wilson’s War (2007), The Social Network (2009), Moneyball (2011), and Steve Jobs (2015)—films, mainly about men, whose respective directors added superb visual panache to Sorkin’s rapid-fire arguments, walk-and-talks, and lengthy monologues. For Molly’s Game, Sorkin makes his directorial debut, telling a story about an unlikely yet inspiring heroine: Molly Bloom, a would-be Olympic skier who misses out on a career in competitive sports due to a freak accident, abandons law school plans, and then builds a multi-million-dollar poker empire among some of the richest, most powerful people in the world. 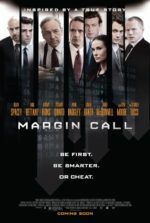 Sorkin’s debut is limber and confident, as one would expect, and it boasts some impressive performances from its cast. Jessica Chastain stars as Bloom in a role that bends to the actor’s considerable talent. Bloom recalls another Chastain character, the titular Miss Sloane (2016), a high-powered D.C. lobbyist with a habit of being the smartest person in any room, a penchant for talking in circles, and a third act ethical awakening. Both characters work in a less-than-savory profession that requires them to control the powerful men around them; they both have an addiction to Adderall; and over the course of each film, after having their principles thoroughly tested, both resolve to follow their moral compass. Molly’s Game starts at the ending and uses a flashback structure and omnipresent voiceover to tell Bloom’s story. 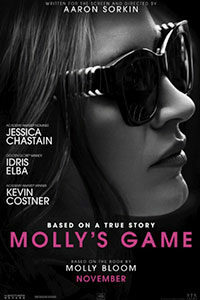 When the film opens, Bloom has published a mostly tell-all book about her life, called Molly’s Game, on which Sorkin based much of his screenplay. She’s also been raided by the FBI, her millions in assets seized, and her freedom left uncertain. Chastain’s narration reveals how Bloom’s skiing accident resulted in a string of events that led to her moving to Los Angeles, becoming an assistant to a scumbag with connections (Jeremy Strong), and then overseeing an exclusive poker game for Hollywood elite. She soon takes over the game for herself, outing her cruel boss and moving his game from a dingy location in the back of a club to a posh hotel room. She starts dressing “like the Cinemax version” of herself, and carefully researches how to avoid legal pitfalls. Meanwhile, Bloom comments on her own biographical drama with all the insight of, well, a screenwriter. At just the right moment, Sorkin-by-way-of-Bloom takes us back to meet her psychologist father (Kevin Costner), who pushes her hard to be a better athlete but nonetheless seems to favor her two brothers. Delving into a basic lesson in Freudian psychoanalysis, which the teenage Bloom wholeheartedly (and ironically) rejects, Bloom acknowledges that many of her subsequent hangups center on unresolved tensions with her father, leading to the film’s real purpose: her familial reconciliation. Bloom eventually seeks the help of a New York attorney, Charlie Jaffey (Idris Elba), to face charges that entail her illegal gambling ring. The FBI seems sure she must have known something about her clientele, which included wealthy gangsters. She named some names in her book but, as it turns out, those names had already been named elsewhere. Rather, Bloom has a hardline stance on keeping what she knows a secret, and not because the information would get her arrested—alone, it probably wouldn’t, as she kept her poker games as clean and by-the-books as any illegal gambling ring could get. She realizes that everything she knows does not violate the law; instead, the information could be used to needlessly ruin families and cause undue embarrassment. Similarly, Sorkin doesn’t engage in naming names (although he uses Michael Cera, playing himself, as a stand-in for actual players in Bloom’s game, like Tobey Maguire, Ben Affleck, and Leonardo DiCaprio). Such principles drive her character and make her seem noble, whereas one must wonder how much willful blindness it takes not to ask questions about who’s playing in your ultra-exclusive illegal poker game, where hundreds of thousands of dollars exchange hands every night. Only peripherally is Molly’s Game about card games. Many of the most engaging scenes in the film take place at the poker table, but not once does a sequence depend on the winner of a hand. Rather, Sorkin chooses certain hands to reveal something about human behavior. Bloom notes the way Cera’s character plays not to win money but to ruin people’s lives. Or a lower-level card sharp named Harland Eustice (Bill Camp) plays a tight and controlled game, and only when his ego is bruised does he lose control. Others, like the hapless “Bad Brad” (Brian d’Arcy James) or drunken Douglas Downey (Chris O’Dowd), attend the game just because they need friends. Nevertheless, Sorkin shoots and cuts the film like a poker game that requires multiple angles and edits to portray. His team of three editors slice and dice the footage, often beautifully shot by Charlotte Bruus Christensen, to create a kind of staccato rhythm that works for the material, even while the viewer remains all-too-aware of the occasionally distracting technique. Sorkin breaks a cardinal rule set forth by film scholars and other directors, which professes that a film much show and not tell. Molly’s Game is all about telling. Bloom tells her story predominantly with voiceover, and the proceedings involve a concentration on fast-paced dialogue. 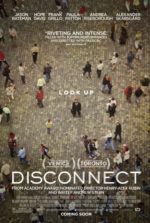 Much like David Mamet’s directorial efforts, Sorkin disproves that old filmmaking adage. Film is an art that engages more than one sense, visual being just one of them. 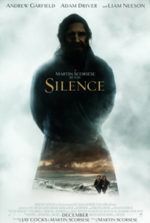 Meanwhile, the first-time director attempts an ambitious, energetic formal approach but cannot sustain that level of intensity for the full 141-minute runtime, just the first half, after which the story naturally slows. Molly’s Game would have been a superior experience overall had Sorkin tried to do less with the material, formally speaking. As is, the film provides a wonderful showcase for Chastain, and offers another in a long line of Sorkin heroes who fight to preserve an ideal, only to find the need for some self-reflection along the way.